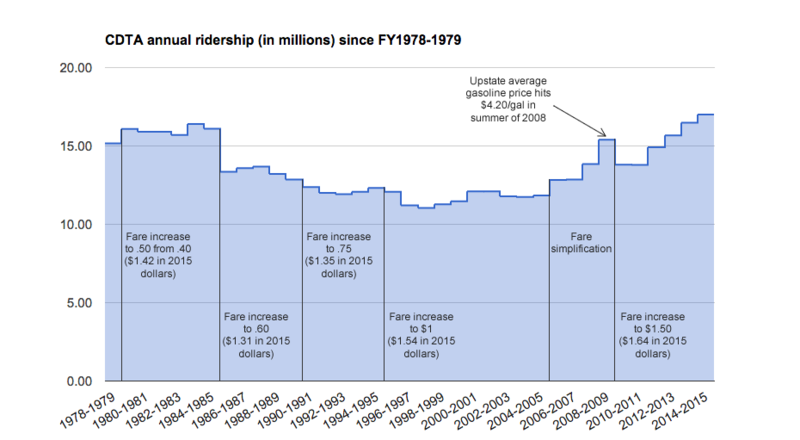 Historical ridership numbers were provided to AOA by CDTA. Population numbers are via the US Census. Gasoline price numbers are via NYSERDA. Inflation adjustments via the BLS online calculator. One of the things we were curious about was CDTA's ridership compared to the Capital Region's total population. So here's a crude workup -- it's per capita annual ridership, based on the decennial Census population counts for the Capital Region four core counties. It's probably not a bad guess to figure that the price of gasoline would have some influence on much people ride the bus. 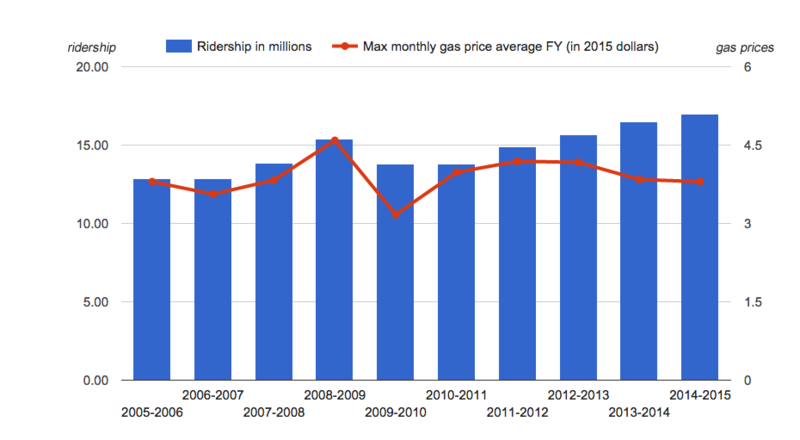 So here's the last decade of ridership along with the maximum monthly average gas price (in 2015 dollars) for each fiscal year. CDTA announced this week that is had more than 17 million boardings in the fiscal year that ended this past March -- that's the highest total in the transit org's history. 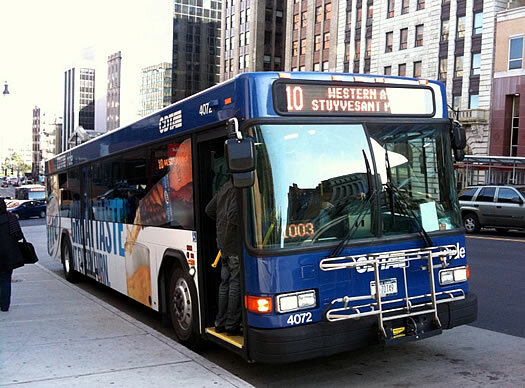 And it's the second straight year that CDTA's ridership number has set an all-time record. The org reports that ridership is up 23 percent over the last five years. And a large chunk of its ridership now falls under "universal access" agreements it's struck with local colleges and employers during the last few years. CDTA says riders using the system under these agreements represented more than 4 million boardings last year. 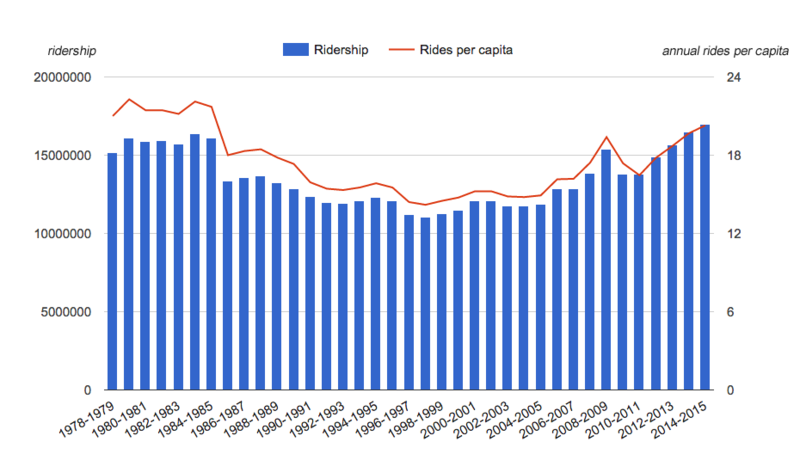 So, put simply, people are riding the bus more often. They're in large format above -- click or scroll all the way up.